All our present day public footpaths and bridleways, and many now extinct, started life as highways, the long distance ones being used by traders and carriers. 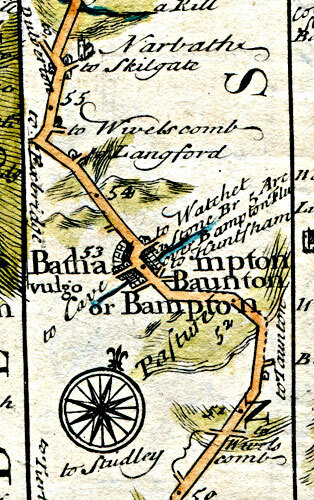 Bampton was a crossing point for two very ancient tracks, or trading routes. Possibly the oldest track originated in the Bronze Age [c1400-600 BC]. It came from Wiltshire via Dorset and Somerset, passing the present Wellington Monument, and entered Devon at Ashbrittle. It passed Cudmore, Forde, through Bampton to Coldharbour, then crossed the ford at Exebridge and on over Exmoor by-passing Dulverton, through Anstey and Molland, and on to north Devon. [H and D on the map ] Sections of that track still exist, probably the most impressive stretch in the Bampton area being a two mile long bridleway leading south-east from Ford towards Wellington. It was still the road from Bampton to Wellington until late in the 19th century. A track branched off this one at Bampton, [C on the map] leaving by Western Way, or West-in-the-Way (the present West Street), and on towards Stoodleigh. A track known to the Celts came from Seaton on the south Devon coast, cutting up across country through Farway, passing Hembury Fort (an Iron Age fort near Payhembury) to Cullompton and Tiverton. It passed through Bampton, then joined the other track towards Molland. [A and D on the map]. A good section of this track exists as a public footpath in Bampton Woods, and is variously known as Packhorse Way, Stony Lane, and Crockford Lane. Stony Lane, being aptly named, fell into disuse with the coming of wheeled transport, as it was impossible for anything which was not travelling on legs, and the new road which was built in the mid 18th century crossing Bampton Down by-passed it, [B on the map] taking most of the traffic which by then included carriages, carts, and coaches. The Tiverton end of the road is still called Bampton Street, and it left Tiverton at the now disappeared Bampton Inn, arriving in Bampton at the Tiverton Hotel which marked the other end of that road. 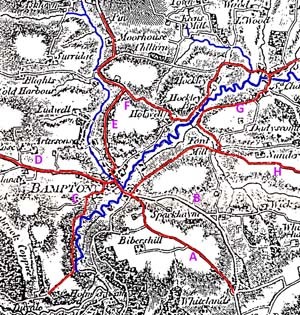 Both north-south tracks, having merged and entered Bampton, crossed the river at the ford and went through the settlement along a route behind the present houses on the east side of Brook Street, then in a straight line through Silver Street and Frog Street. An ancient alternative route from Bampton eastwards was via Frog Street, up a flight of steps [E on the map] and across fields, then south-east along Holwell Lane, [F on the map] by-passing Bampton Castle through whose grounds no public road would have been allowed to run, hence the Dipford-Forde route [G on the map]. These new purpose-built roads did not have pavements, and horse-drawn vehicles at times passed perilously close to house and bridge walls. In order to stop the wheels damaging them, a stone was set at an angle against the wall to deflect the wheels. Many of these are still in place in Bampton on the corners of houses and on river bridges. Another trade route connected Bampton to the ancient ports of Exeter, Watchet, and Minehead, and was used by the lime, stone, wool, and cloth merchants with their trains of packhorses. These are remembered in a Bampton sign, designed at Bampton School in 1989, which is standing on The Stage at what was once known as Quacky Corner, so-named after a Mr. Drake who lived in the house on the site which was demolished in February 1965 in a road widening scheme which had been attempted originally by large army vehicles making a bad job of negotiating the narrow lane and its sharp bends between the buildings during the 1939/1945 war. With all the legislation for the upkeep of the highways, the roads were still far from being conducive to a pleasant ride, and to combat the problem, Turnpikes or Toll Roads complete with their Toll Houses were introduced. There were four toll houses in the Bampton area. The one at the southern end of the town, still called The Toll House, was built in 1819 when the new Tiverton Road was completed, running along the river valley. The Order also allowed for a Turnpike Road to run from Chapmans Bridge (which crosses the River Batherm opposite The Exeter Inn), past Duvale, Westbrook, and Wonham, and on to Exebridge. A toll house at Duvale collected from the approach to the town from across the River Exe, the bridge still being known as Halfpenny Bridge from the amount of the toll. Another toll house is still standing at Exebridge and is known as The Round House. It was operated by the Minehead Turnpike Trust which was set up in 1785 and collected from travellers coming to Bampton from Minehead and Dulverton. Some of the apparently blocked-up windows were where the toll charges were displayed on boards, illuminated by oil lamps at night. Display of the charges and their night time illumination was compulsory. The fourth toll house stood at Shillingford, near The Barleycorn, a public house now closed. More toll gates stood at The Black Cat on the South Molton Road. This section was built in 1819. Whilst there was a large number of toll houses in the area, travellers did not pay at each one they encountered within a Trust’s area. Once they had paid at one gate they had automatic clearance at the other nearby gates in that area, usually 4 to 5 miles. 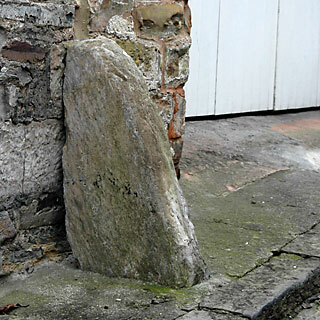 A turnpike stone standing in Brook Street marked the end of the Tiverton Trust area and the start of the Minehead one. 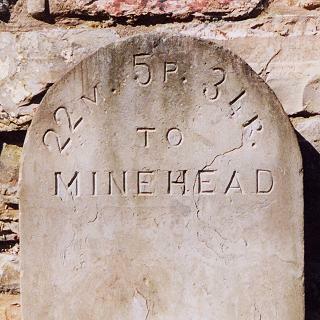 It was put there in 1823 with the distance engraved upon it from that point to its counterpart in Minehead, 22M(iles) 5F(urlongs) 34R(ods). During the 1939/1945 war the engraving was obliterated, undoubtedly with the intention of throwing the invading enemy’s geography into chaos. The wording was replaced incorrectly in paint in 1947, and again rather garishly later. The engraving, copied from the erroneously painted lettering, has been replaced in recent years, now reading 22M 5P 34R. A P(erch) is the same measurement as a R(od) or indeed a Pole!. A turnpike was started between Bampton and Dulverton in 1766. This saw the new Luke Street, the old having been the track through the present church-yard behind Leburn House. This house was rebuilt in 1766 and, seemingly, reversed - the old 17th century front entrance gate and wall now being at the rear. Until then, Leburn house had a garden behind it, but the new road took that away, and later saw houses on the opposite side. The modern roads came, but Bampton retained that all-important north-south and east-west crossing point, making the town still the best means of approach to mid- and north Devon, Exmoor, and parts of west Somerset.